Section IV of Part I Physics question paper of IIT-JEE 2007 contained 3 Matrix-Match Type questions. Each question contained statements given in two columns. Statements A,B,C,D in Column I had to be matched with statements p,q,r,s in Column II. The answers to the questions had to be appropriately bubbled as shown at the end of this post. Characteristic X-rays and hydrogen spectrum are produced by electron transition between two energy levels in an atom. So, (A) is to be matched with (p) and (r). In photo electric effect and β-decay, electrons are emitted from a material. So, (B) is to be matched with (q) and (s). Mosley’s law [√f α Z ] relates the frequency ‘f’ of a particular characteristic X-ray (e.g., Kα ) to the atomic number Z of the target in the X-ray tube. So, (C) is to be matched with (p). In photoelectric effect, the energy of the incident photon is used in dislodging electrons from a photo sensitive surface. So, (D) is to be matched with (q). The appropriate bubbles darkened are shown in figure. The NAND gate will give low output when all inputs are high. The output will be high in all other cases. The inputs A and B are high during the interval from 6 seconds to 8 seconds only. So, the output must be low during this interval only. This is indicated in option (b). The collector current is given by Ic = βIB with usual notations. But, the base current IB = Vi/Ri where Vi and Ri are the base voltage (input voltage) and input resistance respectively. Therefore, IB = 0.01/ 500 = 2 ×10–5 A. The output voltage is the voltage drop across the collector resistance (output resistance) Ro. So, output voltage = IcRo = 1.24×10–3×5000 = 6.2 V.
Voltage gain Av = βRo/Ri = 62×5000/500 = 620. Therefore output voltage = 620×0.01V = 6.2 V]. The expression for the current gain in common emitter mode is β = α /(1–α) where α is the current gain in common base mode. Therefore, β = 0.995 /(1–0.995) = 199. Forward resistance, R = (Change in forward biasing voltage) /(Change in forward current) = (0.1 V)/ 10 mA = 0.1/(10×10–3) Ω = 10 Ω. If the energy gap between the conduction band and the valence band is less than 3 eV, the substance is a semiconductor. So, the correct option is (c). You should remember that the values of molar specific heats at constant volume Cv) for mono atomic and diatomic gases are respectively (3/2)R and (5/2)R where R is universal gas constant. The values of molar specific heat at constant pressure Cp) are therefore (5/2)R and (7/2)R respectively, in accordance with Meyer’s relation [Cp – Cv =R]. Cp of the mixture = Cv + R = (19/6)R.
Ratio of specific heats of the mixture, γ = Cp/Cv = 19/13. [Generally, if n1 moles of a gas having ratio of specific heats γ1 is mixed with n2 moles of a gas having ratio of specific heats γ2, the ratio of specific heats of the mixture is given by the relation, (n1+ n2)/(γ– 1) = n1/( γ1 –1) + n2/( γ2 –1). You can easily arrive at this result]. If one mole of an ideal mono atomic gas is mixed with one mole of an ideal diatomic gas, the ratio of specific heats of the mixture is 1.5. As an exercise, check this. The following sets of experimental values of Cv and Cp of a given sample of gas were reported by five groups of students. The unit used is calorie mole–1 K–1. Which set gives the most reliable values? Since the minimum value of Cv is (3/2)R which is the value for a mono atomic gas, when you express it in calorie mole–1 K–1, the minimum value is approximately 3. [R = 8.3 J mole–1 K–1 = 2 calorie mole–1 K–1, approximately]. Options (b) and (d) are therefore not acceptable. Out of the remaining three options, (c) is the most reliable since Cp – Cv = R, which should be 2 calorie mole–1 K–1 very nearly. When S is open, the P.D. across 3 μF and 6 μF capacitors are 6V and 3V respectively. [The charges on them are equal and the P.D. across them are inversely proportional to their capacities]. When S is closed, the P.D. across them become 3V and 6V respectively since the PD across the 3Ω and 6Ω resistors are 3V and 6V respectively. Positive charges have to flow from Y to X to achieve this condition. Since the potential at point X is to be made 6V for this, the charge flowing to the 3 μF capacitor is 3μF×3V = 9μC. The charge flowing to the 6μF capacitor is 6μF×3V = 18μC. The total charge = 9 μC +18 μC =27 μC. [You may have certain doubts regarding this solution. Once you note that the potentials of the lower potential plate of the 3 μF capacitor and the higher potential plate of the 6 μF capacitor are raised by 3 volts, by the charges flowing from Y to X, your doubts will be cleared]. If the balancing length is measured initially on the side of the unknown resistance X, it will shift from 60 cm to 40 cm. [Remember that the balancing length is measured from the same side before and after interchanging. You might have noted that the balance point in a meter bridge shifts symmetrically with respect to the mid point of the bridge wire]. Therefore, we have X/2 = 60/40, from which X = 3Ω. [If the balancing length is measured on the side of the known resistance, it will change from 40 cm to 60 cm. In this case, 2/X = 40/60, from which X =3Ω]. 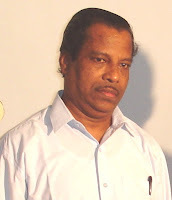 The following three questions which appeared in Karnataka CET 2005 are aimed at testing your understanding of basic principles in electrostatics. The Gaussian surface B is just for distracting you. Remember, Gaussian surface is an imagined surface and it has no action on the charge configuration. When you consider the Gaussian surface A, the net charge enclosed by the surface is –14 nC + 78.85 nC + (– 56 nC) = 8.85 nC. The electric flux over the closed surface A, according to Gauss theorem, is q/ε0 where q is the net charge enclosed by the surface. Therefore, electric flux = 8.85×10–9/8.85×10–12 = 103 Nm2C–1 [Option (a)]. [You should note that the electric flux is the product of electric field and area so that its unit is (N/C)×m2 = Nm2C–1]. The work done is zero since there is no potential difference between the initial and final positions of the charge q. The correct option therefore is (d). Note that this is the case for any closed path of any shape. The capacitance of air cored capacitor is ε0A/d where A is the area of the plates and ‘d’ is the separation between the plates. When the separation is doubled, the capacitance is halved and becomes 1 pF. The capacitance when the inter space is filled with a dielectric of dielectric constant ‘K’, the capacitance is Kε0A/d so that it is increased to K times the value with air as the dielectric. Since the increment is from 1 to 6, K = 6. The following two questions are similar in that both require the calculation of angular momentum in central field motion under inverse square law forces. The orbital angular momentum of a satellite is mvr where ‘v’ is the orbital speed. [Angular momentum = Iω = mr2ω = mr2v/r = mvr where ‘I’ is the moment of inertia and ‘ω’ is the angular velocity of the satellite]. The steps for finding the orbital angular momentum of the electron are similar to those in question No.1, with the difference that the centripetal force is supplied in this case by the electrostatic attractive force between the proton and the electron. If both inputs A and B are zero, the diodes will not conduct and the output point will be at ground potential so that the output Y = 0. 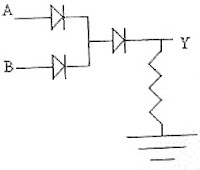 If at least one input is at logic 1 level (+5 volts), the diode connected to that input will conduct. The diode connected to the output also will conduct making the output high (+5V). Thus the output Y=1. The same thing happens if both inputs are high. So, the circuit is an OR gate. The first gate is a NAND gate. The second gate also is a NAND gate whose inputs are shorted. 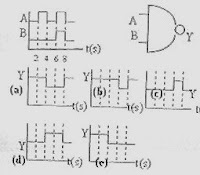 But when the inputs of a NAND gate are shorted, it becomes an inverter (NOT gate). So, the circuit is a NAND followed by an inverter which is altogether an AND gate [Option (e)]. The linear momentum of an isolated system remains constant. This is a very simple question meant for checking your understanding of basic principles. But if you are not careful, you are liable to pick out a wrong answer! Generally, if there are external torques or forces or both, the velocity of the centre of mass will change. So, the condition of no external torque alone is not sufficient to ensure the constancy of the velocity of the centre of mass. Statement-1 is therefore false. [You should also note that an external torque about the centre of mass will not change the velocity of the centre of mass]. The correct option therefore is (d). From this, I = MR2/2, which is the value for a disc [Option (d)]. Two discs A and B are mounted coaxially on a vertical axle. The discs have moments of inertia I and 2I respectively about the common axis. Disc A is imparted an initial angular velocity 2ω using the entire potential enargy of a spring compressed by a distance x1. Disc B is imparted an angular velocity ω by a spring having the same spring constant and compressed by a distance x2. Both the discs rotate in the clockwise direction. ½ k x22 = ½ ×2I×ω2 for the two cases. Here ‘k’ is the spring constant. I×2ω + 2I×ω = (I+2I)×ω’ where ω’ is the common angular velocity of the discs. [We have added the angular momenta since they are in the same direction]. Disc A will have an angular retardation of magnitude ‘α1’ during the time ‘t’ where as disc B will have an angular acceleration of different magnitude ‘α2’ during the time ‘t’. Considering disc A, we have ω’ = 2ω – α1t from which α1 = (2ω – ω’)/t = 2ω/3t since ω’ = (4/3)ω. [An equal and opposite torque will be exerted on B by A. Check by finding α2 and hence 2Iα2]. Don’t be scared by the relatively large number of forks. This is a very simple question. n31 = 2n1 since the frequency of the last fork is double that of the first. Further, n31 = n1 + 30×5 since there are 30 increments in frequency (each of 5 Hz) from the first fork to the 31st fork. Thus we have 2n1 = n1 + 150 from which n1 = 150 Hz. The frequency of the 3rd fork, n3 = n1 + 2×5 = 150 + 10 = 160 Hz. When the first tuning fork is excited, the vibrations of the air molecules are simple harmonic with angular frequency ω = 512π as is evident from the form of the equation, x = A cos(512πt). The linear frequency of vibration of the first fork is n = ω/2π = 512π/2π = 256 Hz. The frequency of the 2nd tuning fork before loading with wax was therefore 256 Hz. After loading with wax, its frequency is lowered. Since the beat frequency is 4 Hz, its frequency (after loading) is 256 – 4 = 252 Hz. 1/λ = R(1/n12 – 1/n22) where R is Rydberg’s constant and n1 and n2 are integers. Ultraviolet radiations are obtained in the Lyman series of hydrogen spectrum when electron transitions take place from higher orbits (of quantum number n>1)to the innermost orbit (of quantum number n=1). So, for the Lyman series, n1=1 and n2 = 2,3,4,…etc. The largest wave length in the Lyman series is obtained when the transition is from 2nd orbit (n2=2) to the first orbit (n1=1). The smallest wave length in the infra red region is obtained when electron transition occurs from the outermost orbit (n2 = ∞) to the third orbit (n1 = 3) and this spectral line is the shortest wave length line in the Paschen series ( for which n1 = 3 and n2 = 4,5,6….etc.). Dividing the first equation by the second, λ'/122 = 3×9/4, from which λ' = 823 nm. In the Rydberg’s relation, 1/λ = R(1/n12 – 1/n22), n1=1 and n2 = 2,3,4,…etc., for the Lyman series. For the Balmer series (which is in the visible region), n1=2 and n2 = 3,4,5….etc. The longest wave length in Lyman series is obtained for n2 = 2 and the highest frequency (shortest wavelength) in Balmer series is obtained for n2 = ∞. λ'/1240 = 3, from which λ' = 3720 Ǻ.
ν = c/λ' = (3×108) /(3720×10–10) = 8×1014 Hz. This question is a simple one and is intended to check your understanding of techniques used in experimental physics in addition to your theoretical knowledge. Since the image appears to the right of the object when the student shifts his eye towards the left, the image is nearer to the student and hence the image distance ‘v’ is greater than the object distance ‘u’. This is possible only if the object is placed between f and 2f. So the correct option is (b). [The image is real since it is inverted as mentioned in the question. The problem can be worked out even if this fact is not mentioned in this problem]. If the angle of incidence is not equal to or greater than the critical angle, there will be partial transmission and partial reflection. As is evident from the figure, the angle between the reflected ray and the refracted ray (angle SQR) is less than 180° – 2θ. The correct option is (c). Laws of reflection are strictly valid for plane surfaces, but not for large spherical surfaces. This is an assertion-reason type MCQ. 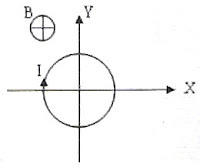 You might have noted that the formula connecting u, v and f was derived considering rays close to the principal axis so that only a small portion of the mirror surrounding the pole is involved. Statement-1 is therefore true. Statement-2 is false since the laws of reflection are applied to a ray which is incident at a given point. The size of the mirror and its curvature are not involved here. You can find all the posts in Optics on this site by clicking on the label 'optics' below this post. This is a very simple question and the correct option is (e). Imagine the wire to be made of a large number of horizontal and vertical elements as shown. There are as many vertical elements carrying current upwards as there are those carrying currents downwards. The magnetic forces on them will be leftwards and rightwards and they will get canceled. But the magnetic forces on the horizontal elements will be in the same direction ( either upwards or downwards, depending in the directions of the magnetic field and the current) and they will get added to produce a net force IλB. The magnetic force everywhere on the loop is radially outwards as given by Fleming’s left hand rule. So, the loop has a tendency to expand [Option (b)]. In the above question, suppose that in place of the option ‘expand’, you had the option, ‘move towards the positive Z-direction’. In that case also, the correct option would be (b) because the loop will act as a magnetic dipole whose south pole is the nearer face. The loop will therefore move towards the reader. V = (πPr4t)/ (8Lη) where ‘η’ is the coefficient of viscosity of the liquid. [You should note that this formula holds good only if the flow is slow and steady (stream-lined)]. πPr4/8Lη = πP'(r/2)4/[8(L/2)η], where P’ is the pressure difference between the ends of the second tube. From this P' = 16P/2 = 8P. 1/Qnet = 1/Q1 + 1/Q2 + 1/Q3 +…..etc. where Q1, Q2, Q3.....etc. are the individual rates of flow when the tubes are connected separately to the same pressure heaed. Qnet = Q1Q2/(Q1+Q2). Here Q1 = 4 cm3. Since the rate of flow through a tube is given by Q = (πPr4)/ (8Lη), we have Q α r4/L. Q2 = Q1×(2/16) = Q1/8 = 4/8 cm3 = 0.5 cm3. The net rate of flow is therefore given by Qnet = (4×0.5)/(4+0.5) = 4/9 cm3 [Option (e)]. As the temperature is constant, we have P1V1+ P2V2 =.PV where P1 and P2 are the pressures inside the separate bubbles, V1 and V2 are their volumes, P is the pressure inside the combined bubble and V is its volume. Since the bubbles are located in vacuum, the pressure inside the bubble is equal to the excess of pressure 4T/r, where T is the surface tension and ‘r’ is the radius so that we have (4T/r1)×[(4/3)πr13]+ (4T/r2)×[(4/3)πr23] = (4T/R)×[(4/3)πR3] where R is the radius of the combined bubble. This yields R = √(r12+r22). If r1 and r2 are the radii of the bubbles and T is the surface tension of soap solution, we have (4T/r1)/(4T/r2) = 4. Therefore, r1/r2 = ¼. Since the volume is directly proportional to the cube of the radius, the ratio of volumes V1/V2 = (r1/r2)3 = (¼)3 = 1/64 [Option (d)]. The excess of pressure inside the smaller bubble is greater than that inside the bigger bubble. (Remember, P = 4T/r and hence excess of pressure ‘P’ is inversely proportional to the radius ‘r’). Therefore, air will flow from the smaller bubble to the bigger bubble [Option (c)].